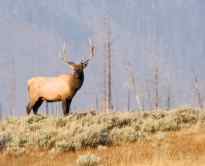 Glade Park and Piñon Mesa public and private lands have some excellent opportunities for hunting deer and elk. There is also a wild turkey season, and some limited sage grouse licenses. If you are interested in hunting this area, the Colorado Division of Wildlife website will give you the information you need to get started. Here are some links that will be helpful. How was the hunting trip? Humorous, disasterous, bad weather, or awesome in every way! Tell us about it, and if you have a picture to prove it, send that too. Pictures are easy to download now! Submit Hunting Stories & Pictures Here! Lookin' for some great wild cookin' ideas? Lookin' for some great ideas on cooking wild game? After disclosing the Moorland family method, the Glade Park Mercantile has a special section on the bookshelf just for variety. We have sorted through to find the best ones: from Ted Nugent's "Kill it & Grill it" to Rick Black's "Cabin Cookin'". Who says wild game isn't good? You just have to know how to do it!